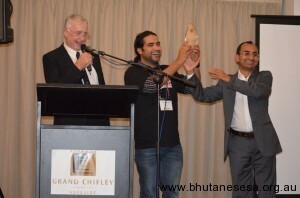 Yuba Sansar team members, Devi Pokhrel and Indra Adhikari receiving the award. 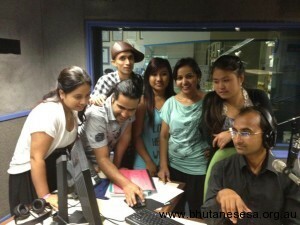 Yuba Sansar, weekly Nepali language radio programme run by young Bhutanese in Adelaide, Australia, was awarded the ‘Multicultural Youth Program of the Year 2012’ on 24 November 2012. This is the highest national award conferred in Australia on multicultural broadcasters. National Ethnic and Multicultural Broadcasters’ Council (NEMBC) gives the award in five categories every year. Yuba Sansar was awarded for its clarity, focus and appeal to the Bhutanese youth community, and showing creativity in presenting their topics combined with their natural and comfortable rapport and confident broadcasting skills. Yuba Sansar is dedicated to engaging with the Bhutanese youth community on everyday issues. It consists of diverse content such as Nepali music, Bhutanese youth news, tips on how young people can watch out for fraudulent emails and phone calls and inspirational stories. Other contents of the program include news related to young people from around the world, inspirational story of world famous people, featuring young talents, stories of old people from Bhutanese community when they were young, multicultural events information in and around Adelaide aiming to help young people make friendship with other communities and learn other cultures and career advice. Bhutanese Australian Association of South Australia (BAASA) takes this opportunity to congratulate our young team at Yuba Sansar for their wonderful achievements in such a short period of time. On this occasion, BAASA also expresses gratitude to Multicultural Youth SA for financial assistance to run the program and Radio Adelaide for mentoring these young people in radio. We hope the mission started by these youngsters to engage young people in productive activities and keep them informed and entertained will continue without hindrances. BAASA executives are very proud of these young people of their devotion and dedication on community service. BAASA executive remains committed to extend all possible support to ensure programs will not go off air.